Learn how to make a perfect Roast Chicken or Turkey just in time for your Thanksgiving feast with this recipe for roasted chicken with herb butter. Roast Chicken is something that I make so often I never even thought to share it with you. No, that’s not true, I did think about it, I just thought that the way I make it is so simple and not overly fancy that maybe nobody would want it. Then I realized that in order to make a fancier roast chicken, you need to know how to make a simple one first! Normally, when I make roast chicken or turkey I stuff the cavity with onions, celery, garlic, and fresh herbs like parsley and thyme. I always coat the chicken or turkey in either olive oil or softened butter. If I don’t have fresh herbs on hand I will make an herb butter with dried herbs, and that’s the recipe I am sharing today. I very rarely truss a chicken, instead I have a rack with adjustable sides that I love. I have no idea where I got it from, but if you can find one I highly recommend it. It holds a chicken or small turkey together perfectly. For a larger turkey you will need to trust the bird, and my friend Becca from It’s Yummi has some great tips on how to truss. If you are trussing, you will want to do that after you fill the cavity with the vegetables and herb butter. Then you will slather the outside of the bird with the remaining herb butter. Start the chicken in the oven at 425 degrees F for the first 20 minutes, then turn the oven down to 350 for the remaining cooking time. Baste the chicken with the pan juices after the first 45 minutes, then again every 30-45 minutes. Baste as quickly as you can so the temperature doesn’t drop, or it will take longer to bake. If it is browning too quickly cover the roasting pan with a loose tent of aluminium foil, but remove the foil for the last half hour for crisp skin. 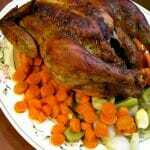 You will have to adjust the cooking time based on the size of your chicken or turkey, allowing 20-30 minutes per pound. A 6-7 pound whole chicken will take about 2 1/2 to 3 hours. You will need to roast it until it reaches at least 165 degrees measured with a meat thermometer inserted into the thickest part of the thighs. 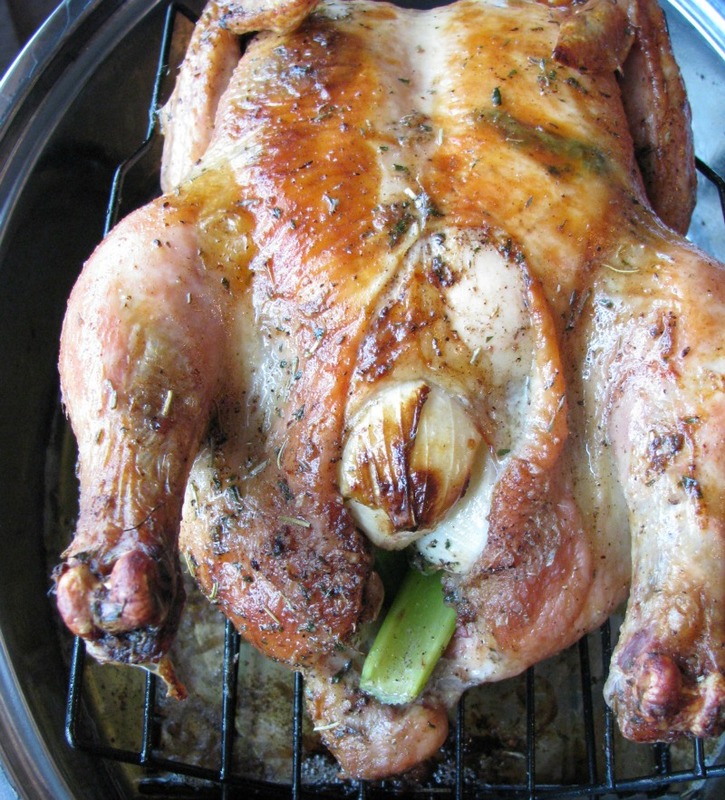 After you pull the roast chicken out of the oven, let it rest for about 10 minutes before carving. Serve along with the vegetables removed from the cavity (please make sure they are thoroughly cooked, if not place the vegetables back in the oven for about 10 minutes. ), along with any other desired vegetables. 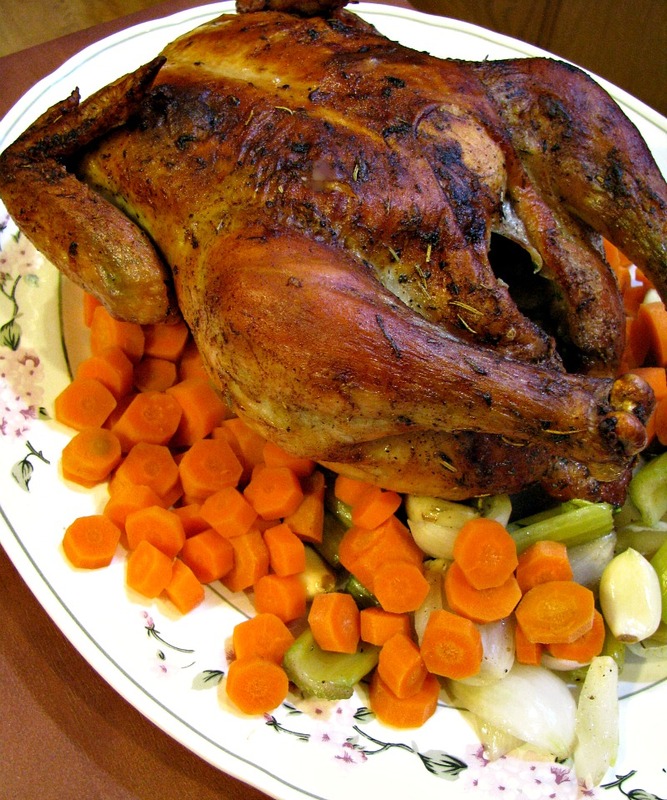 Bring the chicken or turkey out of the refrigerator one hour ahead of time. Preheat the oven to 425 degrees F.
Stir together the softened butter, parsley, sage, rosemary, and thyme leaves until well blended. Pat the chicken dry with paper towels inside and out. Sprinkle liberally with salt and pepper inside the cavity and all around the outside. Rub the inside of the cavity with some of the herb butter, then stuff with the celery, garlic, and onions alternately the pieces. Rub the remaining herb butter all over the chicken. 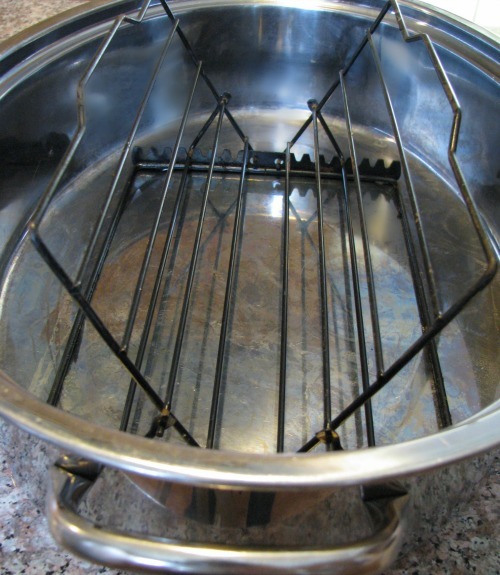 Place on a rack (or truss and place on a raised rack) in a large roasting pan and place in lower third of the oven. Roast for 20 minutes at 425 degrees, then reduce to 350 degrees without opening the oven. Baste with the pan juices after 45 minutes, then every 30-45 minutes, covering with foil if the chicken is browning too quickly. Cook to an internal temperature of 165 degrees as measured by a meat thermometer inserted into the thickest part of the thigh. 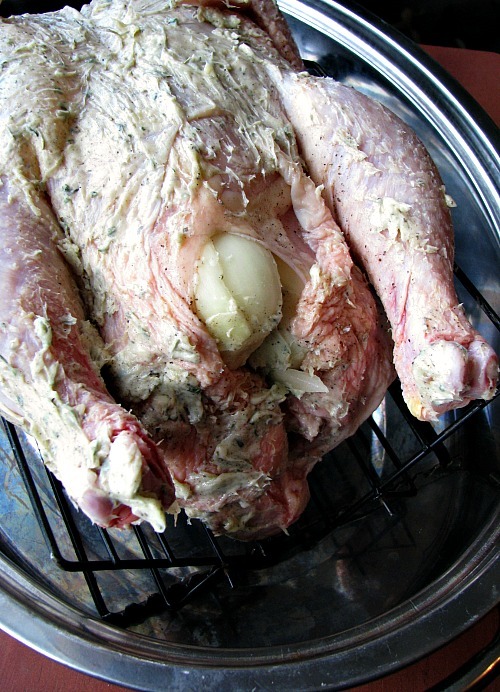 Carefully remove the chicken from the roasting pan and allow to rest for 10 minutes before carving. Cooking time will vary depending on the size of your chicken or turkey. Allow 20-30 minutes per pound.